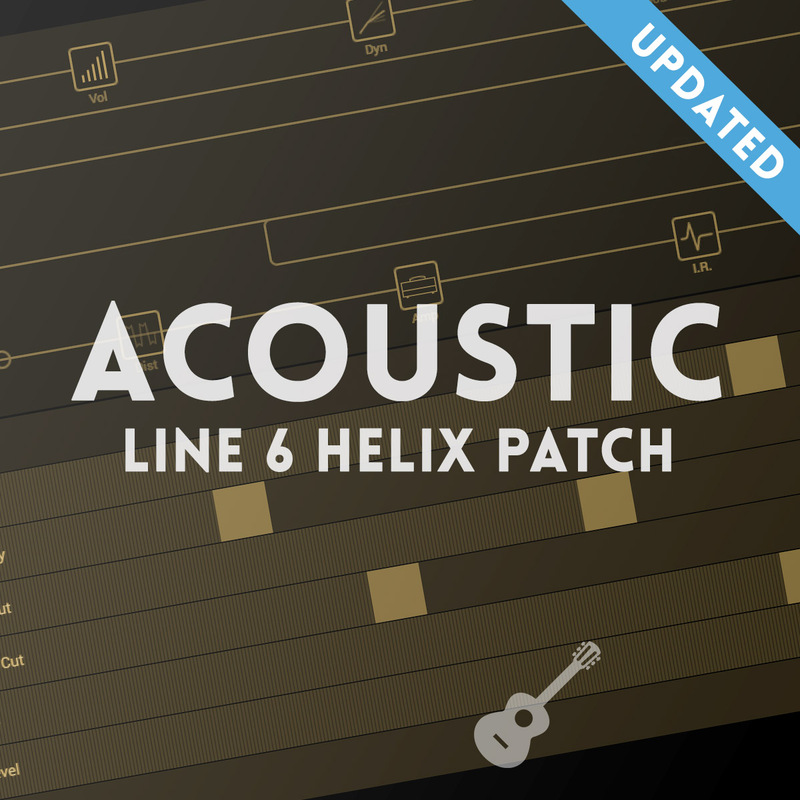 Line 6 Helix patch designed specifically for acoustic guitar. This patch recreates the features of many high end acoustic preamps and DI’s, as well as offering various creative and ambient effects. Current version: 1.2 (released 07/06/2018) – See the changelog below to see how we’ve improved this patch. This Helix patch is designed to be used with an acoustic guitar with a pickup installed (it’s not meant to simulate an acoustic with the use of an electric guitar). We’ve included various effects and features found in many acoustic pre-amps, as well as creative effects often used with acoustic guitar. IMPORTANT: Because this patch uses effects models that were not included with the initial release of the Helix, it is very important that you upgrade the firmware on your Helix and the Helix software from Line 6 to the latest before installing this patch. You will also need the latest version of the HX Edit app to transfer this patch to your Helix. Firmware 2.6 Reverbs: The 2.6 Firmware update changed the mix levels of the new (HX) reverbs. This patch accounts for those changes, so if you are not updated to 2.6 or later on your Helix, the reverbs will not sound right. Half Gain/Unity Gain: We’ve included two volume level versions of this patch, The ‘Half Gain’ patches are designed to use with the Helix volume at 50%, and are roughly the same output level as all our other patches. The ‘Unity Gain’ patches are designed to use the Helix volume at 100%, and are roughly twice as loud as our other patches. The tone of the patch is unchanged – just the output level is different. Parametric EQ Blocks (x4) – these are set up for notch filters, and should only be used to fight feedback – more on that below. This patch can be used in stompbox mode (we recommend all 10 buttons set to stomp on the Helix Floor. If you’re using an LT, you will lose the Compressor and Chorus footswitches, and we feel these will be the least used. We’ve given you a lot of options for reverb and delays. Delay: You have two delays at your feet – ¼ note and dotted 1/8th note. Use these as you would traditional delays. Reverb: For Reverbs, you have three options at your feet – Spring, Hall, and Big Verb (Mod). I personally prefer spring reverb on acoustic – it’s brighter and I think it really brings out the high end on acoustic nicely We’ve set it low in the mix and it will just add a sense of space/life. If you don’t like spring verb, you can use the Plate verb for a low-mix general purpose reverb. The Big/Mod verb is the Glitz reverb, and it sounds pretty huge. It will work well for more intimate songs where you want to fill up a lot of space. If you’re in a larger band setting and are a rhythm acoustic player, this will make your guitar disappear in the mix, so use with caution. Many people like using acoustic-specific IR’s with their direct acoustic signal. In my opinion, this depends greatly on the quality of the pickup installed in your guitar. I use an LR Baggs Anthem in all my acoustic guitars, and I find that using 3rd party acoustic IR’s does not sound better than the mic from the Anthem. If you are using a piezo equipped acoustic (most acoustic pickups are this style), you may have luck with acoustic IR’s. The ones I’ve enjoyed the most are the ‘Mart 45’ IR’s from 3 Sigma Audio. You can find them here. In the demo video for this patch, I have demonstrated using a couple of these IR’s with just the piezo pickup from my LR Baggs Anthem. Feel free to experiment with IR’s, or just ignore them entirely. One thing acoustic players constantly struggle with is feedback, which is where notch filters come in. Notch filters are simply EQ notches that remove certain frequencies that are prone to feedback. Sophisticated notch filters will actually give you different settings for different strings, and that’s what we’ve re-created with the notch filter EQ blocks. There are four EQ blocks that correspond with the lower four guitar strings (Low E, A, G, and D). From left to right in this patch, the EQ blocks engage the E, A, D, and G notch filters respectively. If you are experiencing feedback, try turning these on one by one to see if the feedback goes away. Please note that some guitars and pickup systems are much more prone to feedback than others, and the actual room or space that you are playing in (and the overall volume of the music) play a huge role as well.